For full bibliography for 1970s, 1980s, 1990s,follow links. Move on to 1967or back to 1965. Anon, 1966, Week In, Week Out, Television Review, SouthWales Echo, 3 January. Reader, 1966, Are they Safe [letter re chickens], CorrespondenceColumn, South Wales Echo, 3 January. BJF, 1966, The Roundabout Programme: The Show that's Up tothe Second, South Wales Echo, 4 January. BJF, 1966, School Toilets, letter and comment, South WalesEcho, 5 January. Biography, 1966, BJF [in] The Mensa Register, London:Mensa Publications, January. BJF, 1966, Biological Engineering, International Syndication,Central Press Features, London, 8 January. BJF, 1966, On Hire Now: A Major threat to Privacy, SouthWales Echo, 12 January. BJF, 1966, Ergonomics and Anthropometrics, Voice of WelshIndustry, 15 January. BJF, 1966, Migraine, South Wales Echo, 18 January. BJF, 1966, Food Poisoning, South Wales Echo, 21 January. BJF, 1966, This 'flu: Easy to clear but Nasty while it Lasts,South Wales Echo, 28 January. BJF, 1966, Danger - Mixing Drugs with Drink, South WalesEcho, 4 February. BJF, 1966, This 'Miracle Drug' from a Pretty Plant, SouthWales Echo, 11 February. BJF, 1966, Atomic Age Techniques in Materials Handling, Voiceof Welsh Industry, 15 Feb.
BJF, 1966, Abortion and the Tablets that spell Danger, SouthWales Echo, 18 February. BJF, 1966, Abortifacients, Medical News, 25 February. BJF, 1966, Drugs for Abortion, Birmingham Post, 28 February. BJF, 1966, Let's get these Food Labels Right, South WalesEcho, 1 March. BJF, 1966, Pep Pills Label, South Wales Echo, 3 March. BJF, 1966, Influenza - a correction, South Wales Echo,3 March. Report and Picture, 1966, Meet the Penderocyte - new discovery,Medical News, 178: 1, 4 March. BJF, 1966, The Penderocyte Revealed [with pictures], MedicalNews, 178: 13-15, 4 March. Announcement, 1966, Drug Addiction in Children, South WalesEcho: 1, 10 March. BJF, 1966, Young Drug Takers, South Wales Echo, 11 March. BJF, 1966, This Bottled Menace, South Wales Echo, 17March. BJF, 1966, Danger, Drugs at Work [and] Let's Nip these Seedsof Trouble in the Bud, South Wales Echo, 25 March. [Dover, C.], 1966, Sensational Blood Discovery, London EveningStandard, (?) March. Nationally syndicated report [this examplefrom South Wales Echo, 30 March]. BJF, 1966, Techniques of Voice Analysis, Tape Recorder,8 (3): 98-99, 1 April. Announcement, 1966, Danger on Your Shelf, South Wales Echo,6 April. BJF, 1966, A Colour Code for Pills, South Wales Echo,7 April. BJF, 1966, A Lesson to be Learned? Medical News, 8 April. [BJF, 1966, Mesothelioma Risk, Medical News, 12 April,withdrawn from publication]. Promotion, 1966, Danger Period for polio, South Wales Echo,14 April. BJF, 1966, Polio: It Could be a Grim Year, South Wales Echo,15 April. BJF, 1966, Why Shouldn't Pills Look Like Sweets? MedicalNews, 15 April. BJF, 1966, Wales Lags Behind, Voice of Welsh Industry:17-19, 15 April. BJF, 1966, Polio Scare, Liverpool Daily Post, 18 April. BJF, 1966, Risks of Polio This Year, Reading Evening Post,19 April. BJF, 1966, Springtime Plants, South Wales Echo, 21 April. BJF, 1966, The Ideas People get about Diseases! South WalesEcho, 29 April. BJF, 1966, The Importance of Immunising Against Polio, BirminghamPost: 4, 11 May. Report, 1966, Design Centre for Wales, Voice of Welsh Industry:22, 15 May. 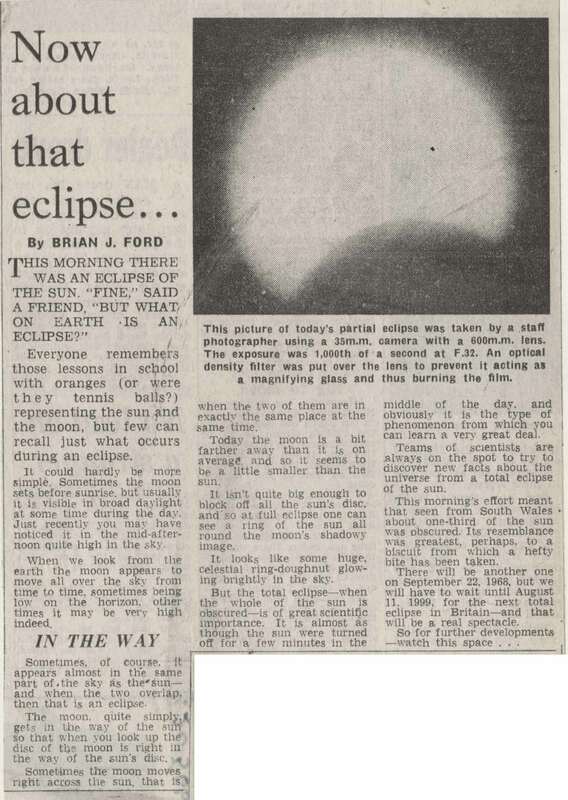 BJF, 1966, Now: About that Eclipse [with picture], South Wales Echo, 20 May. BJF, 1966, On Radiation, Brian J Ford says: It's Better tobe Safe than Sorry, South Wales Echo, 24 May. BJF, 1966, Keeping Smallpox in Check, Birmingham Post, 25May. BJF, 1966, Woodworm - the Holes mean you've Missed Them, SouthWales Echo, 27 May. Entry, 1966, BJF [in] Proceedings of the Royal MicroscopicalSociety, 1 (2): 53, May. BJF, 1966, A Design Centre for Wales? Architecture Wales,3: 21, May/June. BJF, 1966, Man on the Moon by 1969, South Wales Echo:1, 2 June. BJF, 1966, An Echo is the Answer, South Wales Echo,2 June. Report, 1966, Riddle in the Sky Again, South Wales Echo,4 June. BJF, 1966, Brian J Ford Discusses Allergies: This Man was Upsetby Locust Dust, South Wales Echo, 10 June. BJF, 1966, The Cardiff of the Future, South Wales Echo,(?) June. BJF, 1966, Meeting Migraine, Birmingham Post: 6, 14June. Reader, 1966, Those Woodworms, Correspondence Column, SouthWales Echo, 14 June. BJF, 1966, Lightning, Birmingham Post, (?) June. BJF, 1966, Lightning, South Wales Echo, (?) June. BJF, 1966, The Questions you Ask Me! Brian J Ford Replies toSome of his Correspondents, South Wales Echo, 1 July. BJF, 1966, Continental Hazards, South Wales Echo, ?4July. [BJF, 1966, The Real Threat in this Bottled Menace, SouthWales Echo, July]. BJF, 1966, Sunbathe . . . But don't risk Skin Ageing, SouthWales Echo, 13 July. BJF, 1966, Danger From Pets, South Wales Echo, ?13 July. BJF, 1966, What Future for Commercial Transport, Voice ofWelsh Industry: 31-32, 15 July. BJF, 1966, Brian J Ford Writes on: Medical Microscopy Yesterdayand Today, Medical News: 7, 15 July. Reader, 1966, Not-so-noisy, Correspondence Column, SouthWales Echo, 19 July. BJF, 1966, Let's Get Garbage Conscious, South Wales Echo,20 July. BJF, 1966, Can be Noisy, Correspondence Column, South WalesEcho, ?21 July. BJF, 1966, Pets and Disease, Birmingham Post, ?28 July. BJF, 1966, Industrial Heating: The First Lesson, Don't letHeat go to Waste, Voice of Welsh Industry, 15 August. [BJF, 1966, Insecticides, ?not published, South Wales Echo,15 August]. Report, 1966, Knowing the Subject, Television Weekly,25 August. [BJF, 1966, Human Hermaphrodites, South Wales Echo,?6 September]. BJF, 1966, Wales on the March, Leader Column, Voice of WelshIndustry: 5-6, 15 September. BJF, 1966, Brian J Ford Discusses: Biology Teaching in theFuture, Medical News, 2 September. Anon, 1966, Boffin Jazzman, South Wales Argus, 22 September. Swansea Colour Weekly, 7 October. BJF, 1966, The Rural Industries Bureau, Voice of Welsh Industry:24-25, 15 October. Anon, 1966, Radio: review of Magazine Programme Spectrum, ArchitectureWales, No 5, October. BJF, 1966, Brian J Ford Writes on: Fireworks, Swansea ColourWeekly: 6, 21 October. BJF, 1966, demonstrates coal tip experiment, ITN programme on Aberfan disaster, Reporting 66, presented by Sandy Gall, 26 October. BJF, 1966, Brian J Ford Writes on: Whose Fault was it Really?Swansea Colour Weekly: 6, 28 October. BJF, 1966, Including the Kitchen Sink ... Programme Billing,Radio Times, 10 November. BJF, 1966, Unchilled by the Freeze, Voice of Welsh Industry,15 November. BJF, 1966, ... and that's 'ow I ended up in 'orespital, MedicalNews, 18 November. BJF, 1966, Granuloma, South Wales Echo, ?25 November. *Outlines in Record Book 5. College of Art and Design, Newport,Monmouthshire, 1966-1967. Report, with picture, 1966, Experiment to Bridge gap betweenArt and Science, South Wales Argus, 29 November. Picture feature, 1966, Art Students' Visit, South WalesArgus, 30 November. BJF, 1966, Human Hair under Polarized Light, New Knowledge,7 (9): 1379, November. BJF, 1966, Granuloma, Medical News, ?November. BJF, 1966, Cardiff 2066, South Wales Echo, 1 December. BJF (editor), 1966, Science Diary, 128pp, 1st editionfor 1967, London: Letts, December. BJF, 1966, Industrial Effluents, Voice of Welsh Industry,15 December. BJF, 1966, Detergent Danger, South Wales Echo, 21 December. Scientific Encyclopedia, 4th edition, New York: VanNostrand, December.